This Club Melodies pack contains 54 royalty free Trance midi files from Janardana and over 500 high quality 320 kb/s mp3 audio samples with top-sounding professional trance arpeggios. You may hear some of them in the demo. All midi files contain fast arpeggiated riffs (34 fast-single type + 20 chord-type). Each arpeggio is played on several different instruments which gives almost unlimited mixing possibilities. Over 500 mp3 files altogether gives almost 300 MB of sounds recorded using top sounds + top reverbs! As an addition to the pack, you may find 11 trance basslines played through a full scale for compatibility (143 basslines altogether). You may use them for mixing together arpeggios + basslines. At VIPZONE SAMPLES we only create exclusive and the very best of trance samples giving you the potential to create an exhilarating uproar in your parties. With this aim in mind we present our latest trance midi collection titled Trance Arpeggios to give you a sensational experience in creating wonderful music. Feel free to un-wrap this plush looking pack and become part of the exciting ruckus we have in store for you. The pack is overflowing with trance midis, arpeggios recorded in premium quality mp3 and midi files. We envision the same successful future for you as a high flying commercial music producer and to facilitate our mutual goal we give you the following in this amazing package. Midi files – exceeding 50 nos. 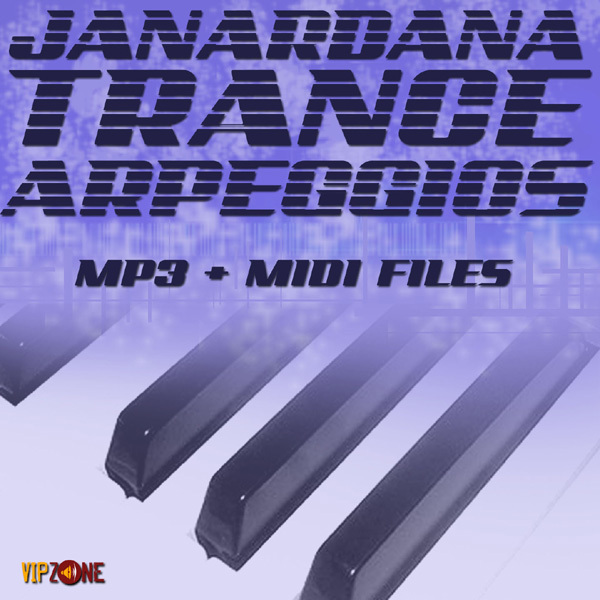 The trance midi files comes to you from popular Janardana and this is complemented with superior quality unmatched mp3s of over 500 all recorded in 320 kbs for high quality. Check out the demo to listen to some of the trance arpeggios contained in the original midi and audio loops pack. The fast paced arpeggiated riffs which is included with a 34 fast to single type plus 20 chord types is the essence that provides extra strength and vigor to the midi files. The trance midi pack also comes to you with a special bonanza offer where each arpeggio can be played on multi-instruments to provide you with unlimited mixing possibilities. If your concern is top sounds and top reverbs we have the best sound quality of 300MB in this trance midi and loops pack with 11 additional trance basslines for full scale compatibility and 143 basslines for mixing together with the midi and audio arpeggios. The trance loops and synths add to the magnetism of the trance melodies and will force others to join in with the novel excitement created by you. The finishing touch for this powerful package is our royalty free offer allowing you the freedom of hassle free commercial production. Get ready to go commercial and take a step further than being a mere hobbyist. Your mega break is just a few clicks away.